Sweet Jesus! What’s going on in here? 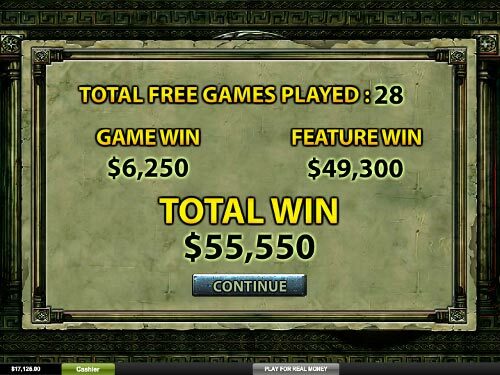 Playtech has started the fight to the last drop of Gods and Titans’ blood. Huh, the battle promises to be super impressive. Throwing lightnings on the 25 lines, the war between these strong men will start immediately. Don’t be afraid, be brave and come closer to this no download champ of battle. What else can you notice on these 5 reels? Are such characters as Chronus, Hera, Poseidon or Selena familiar to you? 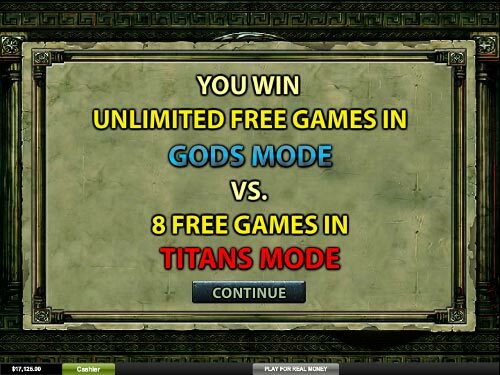 Yeah, they are the main heroes of Battle of the Gods Slot Machine. The victory is really impossible without Atlas, Oceanus, Ares and the others. Whose side are you on? In case you support the Gods, wait for them to cover your screen, or at least come out on 5 positions on reels 2, 3 and 4 and create an X-shape combination. This is how the X-Feature is activated. Do you know what to expect? 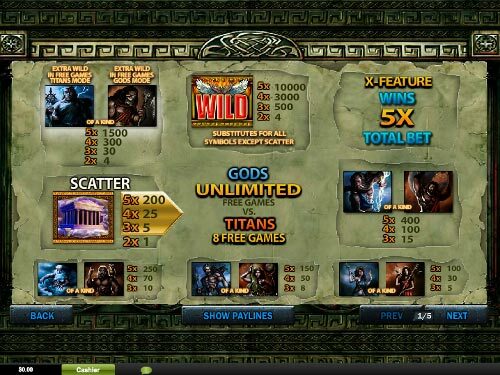 In fact, you will get a 5x Multiplier to your total bet, which is actually added to the scatter and line wins. Nothing comes to us in an easy way. We still have to struggle to get something we want. That’s why you need to be on the look out to catch 3 or more Olympia icons anywhere on your reels and open the world of immortal Free Games. 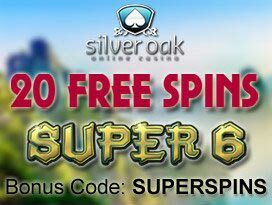 At the start, you’ll find yourself in Gods Mode having unlimited number of Free Spins. However, once you see Cronus as an extra wild in the middle position, say goodbye to the Gods. Now, you are enjoying the feature with Titans Mode. 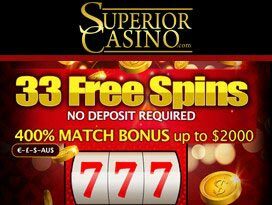 This means you have 8 Free Spins to relish and in case you meet Zeus symbol on the 3rd reel, be ready that this extra wild will take you back to the previous Mode. Isn’t that just fantastic? Be lucky enough to retrigger the feature again and again to take advantage of chargeless spins infinitely. Have you seen that Fierly Wild? Besides the fact that it is your source to get the highest prize, this wild symbol is also powerful enough to replace all the others but scatter. 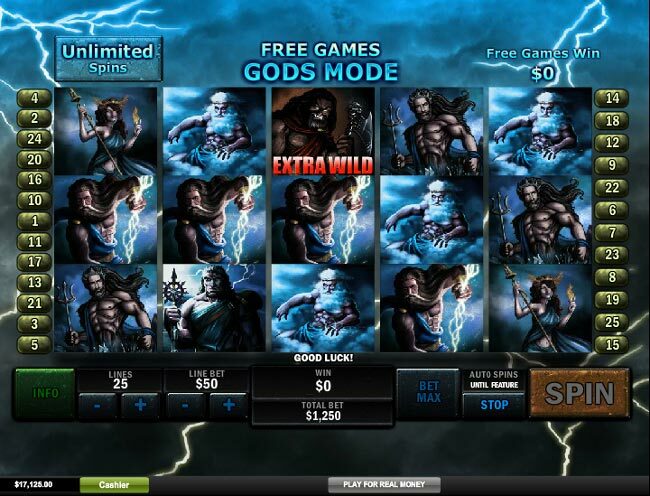 Opening the legend of Greece, go further and reveal the secrets of Ancient Egypt with The Pyramid of Ramesses that is one of the slot machines with high limit bets. Are they more attractive to you? Since Olympia is known as the sanctuary of the Gods, it also takes the part of the scatter symbol in the slot. Doing magic and paying wherever it lands, the scatter can make you rich and endue 1x, 5x, 25x and 200x Multiplier if you simply collect up to 5 Olympia icons. To tell the truth, combined with the max stake, the scatter has $250,000 for you in store. Just try your luck! Speaking about the game rules, you can’t pass the part with choosing a coin size. 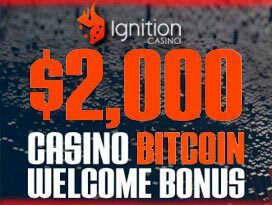 There is a wide variety in front of you, starting from $0.01 and reaching $50, you are free to play with that stake, which is appropriate and right for you. Not a big deal, you want to observe the most legendary battle, so don’t begrudge $1,250 for your each spin. What will you gain giving all you have? Some people may think it’s not worth it, however, once you know the size of the top jackpot, you will change the views. How about getting a $500,000 cash prize as soon as you collect a line of wilds? Can you find an easier way to obtain half a million with such a pleasure? As you can see, besides the fact that this is a real fight, the battlers are not so scary. 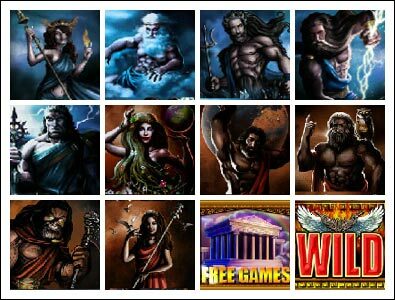 Awarding you various prizes and giving numerous chances to seize the win, Battle of the Gods Slot Machine makes you love the history and be eager to learn more about Ancient Greece. Don’t go anywhere, start the slot and find out everything you need to know.